On Wednesday, October 25, the Open University has launched OpenLearn. "The OpenLearn website will make educational resources freely available on the internet, with state-of-the-art learning support and collaboration tools to connect learners and educators. This £5.65 million project, generously supported by a grant from the William and Flora Hewlett Foundation, will cover a full range of subjects from arts and history to science and nature, at all study levels from access to postgraduate". The launch of OpenLearn is the major open content initiative that follows the MIT OpenCourseWare (MIT OCW) initiative. The OpenLearn website is based on the open source course management system Moodle, as announced by Martin Dougiamas, Moodle community leader and lead developer in November 2005. This Open University OpenLearn as well as MIT OCW initiatives are good steps towards the democratization of learning, however I believe that learning is more than content and learning object repositories or technologies. Learning is about communities and knowledge sharing. It would therefore be great to also get access to students and knowledge brokers at Open University and MIT rather than only to get access to content. Google has recently launched the Google Custom Search Engine. "It's a simple and straightforward product to use and understand. In a matter of minutes you can create a search engine that reflects your knowledge and interests; looks and feels like your own; and, if you choose, you can make money from the traffic you receive through Google's AdSense program. You can even invite your friends and trusted community members to add to and help build your search engine", claims the Google Co-op team. This is however not new. For instance Rollyo also allows users to create customized search engines containing up to 25 websites on a particular subject area. Eurekster’s Swicki is also an example of such custom search engines. Social software - often connected to older forms of computer mediated communication (CMC) and newer discussion about online communities - can be defined as software that supports activities in digital social networks. The use of new digital media tools such as blogs, wikis, tagging and other communicative or multimedia assets create new challenges for interdisciplinary research in media informatics. * Are there new models of labour, new processes and new forms of organisations possible? * Will users be empowered or will lack of data protection and privacy set free new genies? * What is the impact of tools supporting social structures on the emancipation and appropriation? * Will they help facilitating new forms of democracy, digital rights, and overcome the digital divide? * Or will the hunt for digital reputation lead to cow paths where only cows walk by? The second international symposium on perspectives in media informatics is organized jointly by the two leading collaborative research centres for media Media and cultural communication and Medienumbrueche, the Bonn-Aachen International Center for Information Technology B-IT, and the Network of Excellence on technology enhanced professional learning PROLEARN. It brings together researchers and practitioners from media informatics, sociology, ANT, law, media theory, social software, collaborative work and learning, to discuss current trends and emergent issues of sociality in digital networks in a mixture of invited talks and round table events. The event will be accomplished by online activities and practical exercises in social software. Amazon has launched 2 new question-answer services available in beta versions: Nownow and Askville. These 2 services can be viewed as Web 2.0 services since both are user-centric. NowNow's FAQ states "NowNow is a service that mobile users can use to find answers to any question via mobile email. When you post a question to NowNow via email (ask@nownow.com), our NowNow workers will surf the web to find the answer for you. NowNow workers are users who are being paid to search the web on your behalf. NowNow bypasses the need for mobile users to go to the web to find answers to questions as NowNow will send you an email with up to 3 answers to each question you ask. We have not finalized our pricing for each question, however, we expect each question will cost less than $0.25. During this beta-test period all questions asked will be FREE." NowNow is similar to Google Answers, both are charging services and people are paid to answer a given question. Askville is a question-answer service where one can ask any question on any topic and get real answers from real people. This service is very similar to Yahoo! Answers, both are free services that rely on users who can ask and answer each other questions (the wisdom of the crowd). Dojo - one of the most popular Ajax toolkits - version 0.4 has been released. The new release "contains many exciting new features, a whopping 529 bugs closed, and the initial release of the long-awaited documentation tool, with inline API documentation that will continue to improve with follow-on releases. These improvements will make Dojo appealing to entirely new audiences and will bring Ajax applications to a new level of acceptance as a first-class user environment", the Dojo team claims. 2 weeks ago Bret Taylor, Senior Product Manager at Google, announced the launch of a new Google beta service: Google Code Search, "which gives programmers a single place to search publicly accessible source code", Bret said. I´ve been trying the same with different search queries, and indeed the result was promising and very fast. This is however not new, Koders and Krugle have been providing such a service for a long time. I believe that this competition will make our lives as software developers much more easier. Just came across this new Web 2.0 tool when browsing through Harold Jarche´s blog. Vyew is a free "Web conferencing and Always-on collaboration platform that enables shared visual communication from any web browser in less than 10 seconds! Vyew users can collaboratively create and share Microsoft PowerPoint-like pages over the web by intermixing Microsoft Office and Adobe PDF files, images, white-board annotations, and more", the product team claims. Robin Good states that "Vyew is a very cool new online collaboration tool which allows anyone, on any type of computer, to share and annotate his ideas, documents, presentations or digital images, in real-time, and with up to 20 attendees". Vyew version 2.0 has recently been released with new features. I didn´t try it out yet, but Harold reported a positive experience with Vyew while using it for slide sharing and text chat in the Informl Learning Unworkshop along with Skypecast for voice. According to Harold "Vyew, especially when combined with Skype, makes for a powerful platform for rapid informal learning". The Java Posse podcast of October 15 was a GWT round table with Robert Hanson, Ryan Dewsbury and Bruce Johnson. The discussion was about the past, present and future of GWT (e.g. comparison with other Ajax toolkits, performance issues). The article also pointed me to the GWT blog. Several other interesting links have also been provided. The GWT round table podcast is available here. When browsing through Stephen´s blog, I came across his new paper "Learning Networks and Connective Knowledge". Stephen also provides PowerPoint Slides for the same. In the abstract of his paper, Stephen states "The purpose of this paper is to outline some of the thinking behind new e-learning technology, including e-portfolios and personal learning environments. Part of this thinking is centered around the theory of connectivism, which asserts that knowledge - and therefore the learning of knowledge - is distributive, that is, not located in any given place (and therefore not 'transferred' or 'transacted' per se) but rather consists of the network of connections formed from experience and interactions with a knowing community. And another part of this thinking is centered around the new, and the newly empowered, learner, the member of the net generation, who is thinking and interacting in new ways. These trends combine to form what is sometimes called 'e-learning 2.0' - an approach to learning that is based on conversation and interaction, on sharing, creation and participation, on learning not as a separate activity, but rather, as embedded in meaningful activities such as games or workflows". A nice paper indeed with several new theories and trends in learning settings such as connectivism, learning networks, e-learning 2.0, and PLEs, that Stephen has put together into one interesting paper. Many thanks Stephen for the nice paper! David called my attention to a mega action/project initiated by the British Library. 'One Day in History' is the name of this project. Everyone is asked to take part in the biggest blog in history by writing a blog diary about what s/he has done on 17 October 2006. The diary will then be stored by the British Library as a historical record. The British Library states "We want to people to reflect how history impacted on them that day – by simply commuting through an historic environment, or how business history influenced their decision-making, or merely that they looked up some old sports statistics or listened to some pop music from the 1960s. We want to record the ordinary lives of citizens. By doing so in vast numbers, everyone should feel that they are contributing something permanent and valuable to the historic record with material that could be used by historians and researchers for centuries to come". Spiegel Online has also pointed to this big project. I wrote last week about Web 2.0 Driven Book Writing and pointed to George Siemens´new book Knowing Knowledge. As promised, George has just released his new book as free downloadable pdf files. Nice images are also available on flickr and discussion is possible through the Knowing Knowledge Wiki. Have fun with reading and discussing! I´m trying here to collect Google and Yahoo Web 2.0 oriented services and put them together into one table. Still much more Google and Yahoo! products and services are available. The table below shows that, so far, Google suite includes more Web 2.0 oriented services than Yahoo! suite. But, this situation might change at any time, since Google and Yahoo! are adding every day new Web 2.0 services to their suites. Today, at the chair of Informatik V, Aachen University Germany, we organized a developer´s day in an attempt to introduce Web 2.0 trends such as Ajax and Ruby on Rails. Nanda introduced Ajax und pointed to several intersesting sources related to the same. Heike talked about Ruby on Rails. I´m trying to compile 2 lists of interesting sources related to Ajax and Ruby on Rails. The lists will be updated regularly. Google has launched a new beta service: Google Docs & Spreadsheets. Here is a mini tour to get familiar with the new service. Actually it´s just the combination of Writely, the collaborative Web word processor which became part of Google as of March 2006, and Google Spreadsheets into one service. Jen Mazzon, leader of the Writely team and now senior product marketing manager at Google, describes the new service as "one place where you can create, store, share and publish your documents and spreadsheets online". Use the online editor to format documents, spell-check and more. 2 days ago, Google has also added a new service to the Google suite: the online video portal YouTube. On the Learning Circuits Blog, Tony Karrer asks the question, "should all learning professionals be blogging?". If I have to answer this question, I would say no. It´s true that blogs are one of the major tools of the Web 2.0 movement, and blogs are becoming more and more popular. But, Web 2.0 is more than tools and technolgies. Web 2.0 is user centric i.e. the focus has to be put on the end user. We cannot force anyone to use a tool that we think would best fit to his/her needs. What we can do is just to provide a myriad of services/tools, maybe give some recommendations where to find potential resources, services, communities, experts/knowers that might help solving a specific problem or point to what others have done while facing similar problems, then hand over control to the end user/learner/knowledge worker to choose from and use the offered services etc. the way s/he deems fit. This is real personalization! The traditional way to write book is a one direction process, i.e. from the author (knowledge creator) to the reader (knowledge consumer). The "public" has to wait until the book is released to get the chance to read, comment, discuss, and use the same for further work. The resulting knowledge in this case will likely be out-of-date in a rapidly knowledge changing era and more likely not of high quality, for it does not cover the whole landscape, since it´s the opinion of only one author or a restricted group of authors. George Siemens has chosen another way to write his new book "knowing Knowledge" that according to George will be available by October, 13. George offered a wiki and a blog for researchers to contribute and discuss the ideas and concepts of his book, before it gets published. In doing this, George has given a nice example of how to edit a book based on Web 2.0 concepts. This form of book writing does meet most of the Web 2.0 key principles e.g. The Web As Platform; Harnessing Collective Intelligence; End of the Software Release Cycle. For sure the final outcome of this form of book writing will be up-to-date, quality knowledge, for it´s the result of collaborative knowledge creation and collective intelligence. That´s the power of Web 2.0...The power of many! The final program of The 4th International Workshop on Wireless, Mobile and Ubiquitous Technologies in Education (WMUTE 2006) has been published. David will present our paper "Mobile Web Services for Collaborative Learning". "Since learning nowadays is conceptualized as a social system within communities of practice, the best way to learn is with others, in groups. In the past few years, there has been an increasing focus on social software applications as a result of the rapid development of Web 2.0 technologies. Furthermore, mobile and ubiquitous technologies have provided capabilities for more sophisticated open social systems, where mobile knowledge sharing is the norm. In this paper, we explore the use of Web 2.0 concepts and social software for learning and present a smart phone driven mobile Web Services architecture for collaborative learning." Proceedings of the 4th International Workshop on Wireless, Mobile and Ubiquitous Technologies in Education (WMUTE 2006), November 16-17, Athens, Greece, 2006. The learning process concepts discussed here are abstracted from Nonaka and Takeuchi´s SECI cycle, given in their book “The knowledge creating company” (Nonaka, Takeuchi, 1995). According to these authors, there are two different kinds of human knowledge: tacit knowledge and explicit knowledge. Tacit knowledge - a term introduced by Michael Polanyi in 1967 - is the personal and hidden knowledge which resides within the mind. Examples of tacit knowledge are know how, expertise, understandings, experiences and skills resulting from previous activities. Tacit knowledge is personal and hard to formalize, codify or communicate. Unlike tacit knowledge, explicit knowledge is codified, systematic knowledge that can be transmitted in formal language. It can easily be captured, accessed and shared. Similar to the knowledge creation process, the learning process is knowledge in action, a cyclic conversion of tacit knowledge and explicit knowledge. This spiraling, highly dynamic and complex process is modeled in the figure below. It consists of four modes: socialization, externalization, combination, and internalization. These modes occur when tacit and explicit knowledge interacts with each other. In the following four sections, we examine each of these modes. Socialization: Socialization is the first mode in the learning process and the primary source of learning. As Polanyi (1967, p. 4) mentioned “We know more than we can tell”. There is a huge mass of high-quality tacit knowledge embedded in people, which is not easily expressible. This knowledge can, however, be made available to others through socialization. In this mode, learning occurs implicitly, within a social context through observation, imitation, participation, interaction and practice, rather than through written or verbal communication (e.g. on the job training). 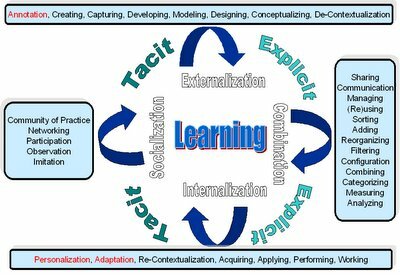 The process of acquiring tacit knowledge can be supported by joint activities, personal connections, social networking, and community of practice (CoP) building. CoP “are focused on a domain of knowledge and over time accumulate expertise in this domain. They develop their shared practice by interacting around problems, solutions, and insights, and building a common store of knowledge” (Wenger, 1998). Therefore, a learning system should include an effective collaborative learning environment that can encourage tacit knowledge sharing and facilitate socialization. Externalization: Through externalization, tacit knowledge is made explicit, i.e., expressed in language or symbols, in a form which can be accessed, understood, shared, adapted, and reused. The conversion of tacit into explicit knowledge involves techniques that help to express one’s ideas or images as words, concepts, figurative language (such as metaphors, analogies or narratives) and visuals (Nonaka, Konno, 1998). Externalization is a complex process aiming at creating high-quality and valuable learning objects. In the externalization process, software engineering concepts and principles should be applied. The first step in this process is knowledge de-contextualization. That is, extract knowledge from its context such that it is not bound to the situation from which it stems, thus enabling the reusability of this knowledge in different learning situations. The next step is planning. That is, define a set of goals and requirements that need to be achieved. Good planning will leverage the created learning object (i.e. knowledge component) to its best use. Parts of the planning process are on the one hand to determine the target user’s needs, preferences, interests, skills, learning goals, background and on the other hand to fix the knowledge level that he/she will have acquired at the end. Modeling and modularity are the cornerstones of the externalization process. It is crucial to disaggregate a learning resource into tiny learning objects and identify how these objects relate to each other. Those modular learning objects can then be reused by different user communities for diverse purposes. Once the objectives of the new learning resource are defined and modular learning objects are identified, it is possible to move to the development step using all software and hardware means that are able to reduce the time to develop valuable learning content such as simulations and experiments. The result of the application of software engineering concepts in the knowledge capturing process will be granular, organized and reusable learning objects. Successful knowledge capturing also requires the use of metadata for describing learning objects as well as adopted, common, open and accredited standards (Hodgins, 2000). According to Hodgins, metadata is the full and rich set of information needed in order to find, filter, select, and combine the information. Metadata becomes increasingly important and is required to annotate learning resources in order to support indexing, storage, search, and retrieval of appropriate learning resources or learning paths relevant for a specific learner or a group of similar learners (Chatti et al., 2005). It is also crucial to use standards for metadata and learning objects to provide fixed data structures and communication protocols for learning objects and cross-system workflows (Ellis, 2005) and assure accessibility, interoperability, adaptability, reusability, durability, and affordability of learning (Hodgins, 2000). Furthermore, since knowledge must be current in order to be of value, attention should be paid to the development of up-to-date and dynamic learning resources. A possible way to achieve this is, instead of inserting an existing learning object into a learning resource, just to point directly to the community which is currently working on the development of this object. 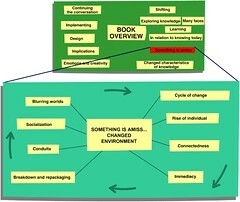 To achieve best results from the externalization process, a learning system should include a standard-based, collaborative and effective knowledge capture system (can also be called a knowledge representation system or an authoring system) that supports learning communities in designing, creating, reviewing, modifying, and posting up-to-date and valuable learning objects in a short time. This system should particularly include an intelligent component for automatic learning object annotation, which is based on powerful data mining algorithms and advanced pattern recognition techniques. Combination: As discussed in the previous section, the output of the externalization process is granular, annotated, classified, context free, standard-based, and up-to-date learning objects (i.e. explicit knowledge). These quality learning objects can now be shared, disseminated, stored, reused, analyzed, re-categorized, re-contextualized, reconfigured, reorganized, combined, and delivered. The manipulation of existing learning objects leads to new, possibly more complex learning objects. This process is referred to as combination. The combination process is supported by learning repositories to store and manage learning objects and their associated metadata, as well as learning paths and activities. In case these repositories are based on standards for interoperability and reusability, they can be accessed and managed so that they are available as a virtual single pool of learning objects and metadata (Hodgins, 2000). In a learning repository, new modular learning objects can be added and existing ones can be analyzed, compared, sorted, restructured and associated. This results in new learning object configurations and combinations or new learning paths that can be applied to address different learner needs and solve new problems. In addition to learning repositories, the combination process is most efficiently supported in collaborative environments utilizing information technology (Nonaka, Konno, 1998). Stacey mentioned that active and alive learning environments are more like learning communities than learning repositories. They focus on bringing people to people not just people to content (Stacey, 2003). According to this, learning has to occur within a social context which supports listening, viewing, reading, writing, speaking, commenting, suggesting, asking, discussing, disseminating, and sharing of learning objects and best practices among community members (i.e. academic and professional novice/mature learners, customers in an organizational context, peers, learning facilitators, coordinators, mentors, experts). To help building the required personal connections in an online social network, the use of synchronous and asynchronous communication tools is crucial (e.g. e-mail, instant messaging, video conferencing, Voice-Over-IP, group scheduling, announcements, news, events, calendar, weblogs, wikis, webfeeds). In addition to learning repositories and learning communities, powerful access and search capabilities across content, metadata and people are required. A learner should be able to query the learning system to quickly locate appropriate learning resources, as well as persons who share his/her interests or experts who can help achieving better results. Internalization: Internalization is the conversion of explicit knowledge into new tacit knowledge (Nonaka, Konno, 1998). In the learning process, internalization refers to the embodying of knowledge through reflection and application of the gained explicit knowledge in a given context. It is closely related to learning by doing, performing, and working. In the internalization process personalization is the key. Personalization is the ability to get just the right stuff to just the right person at just the right time and place in just the right way and with just the right context on just the right device and through just the right medium (Hodgins, 2000). The learning system should include an intelligent personalization/adaptation engine, able to deliver quality learning resources that are tailored to the learner’s needs, preferences, interests, skills, learning goals, cultural background. Chatti, M. A., Klamma R., Quix C. , Kensche, D., 2005. LM-DTM: An Environment for XML-Based, LIP/PAPI-Compliant Deployment, Transformation and Matching of Learner Models. Proceedings ICALT 2005, July 5-8, Kaohsiung, Taiwan, 567-569. Ellis, R. K., 2005. E-Learning Standards Update. Learning Circuits, Article. Retrieved October 26, 2005, from http://www.learningcircuits.org/2005/jul2005/ellis.htm. Hodgins, H. W., (2000, February). Into the Future. Learnativity, Vision Paper. Retrieved October 25, 2005, from http://www.learnativity.com/download/MP7.PDF. Nonaka, I., Konno, N., 1998. The concept of “Ba”: Building foundation for Knowledge Creation. California Management Review, Vol. 40, No. 3. Nonaka, I., Takeuchi, H., 1995. The Knowledge-Creating Company. Oxford University Press, Oxford. Stacey, P., (2003, February). People to People not just People to Content. E-Learning for the BC Tech Industry, Article. Retrieved November 2, 2005, from http://www.bctechnology.com/statics/pstacey-feb1403.html. Wenger, E., 1998. Communities of practice: Learning, meaning and identity. Cambridge University Press. Cambridge, UK.